One man’s thrilling journey through an enchanted world to find his wife, who has disappeared after seemingly committing an unforgiveable act of violence, from the award-winning author of the The Devil in Silver and Big Machine. Apollo Kagwa has had strange dreams that have haunted him since childhood. An antiquarian book dealer with a business called Improbabilia, he is jus One man’s thrilling journey through an enchanted world to find his wife, who has disappeared after seemingly committing an unforgiveable act of violence, from the award-winning author of the The Devil in Silver and Big Machine. So what happened to Brian West? Lillian says she "Knows exactly where he (Brian) is. He's where I left him". Does this mean jail for attempting to hurt Apollo? Who left the memento box at the door? What is the significance of the protagonist's name: Apollo Kagwa? I was hesitant to read this because I didn't love the author's most recently written novella, The Ballad of Black Tom, but after a few key recommendations, I decided to pick it up. And I'm glad I did. I loved the characters and enjoyed LaValle's creepy, atmospheric, magical NYC. The first quarter of the book or so is really chill. We meet the characters, particularly married couple Apollo and Emma, who are cool and relatable, and who we grow to enjoy spending time with. There's some c 4ish stars. The first quarter of the book or so is really chill. We meet the characters, particularly married couple Apollo and Emma, who are cool and relatable, and who we grow to enjoy spending time with. There's some creepiness and nightmares lurking in the background, but for the most part things are just enjoyable, floating along. Then BOOM. Out of nowhere we get a boiling pot of water poured over our heads to wake us up. That early instance may be the most disturbing, but there's plenty of freaky, unsettling stuff throughout the rest of the novel. I especially enjoyed the dialogue of the characters and for the most part I liked LaValle's prose as well. He does a great job blending real-life horrors, trends, conflicts, tensions and status quos with the horrific monsters of fantasy and fairy tales, although I found the real-life horrors to be much more frightening and engaging. Apollo Kagwa grew up without a dad and now that he's a brand new father himself, he is determined to be there for every second of his son's life. Every second, that is, until his wife suddenly, crazily, gets it into her head that their baby is not their baby at all, but something else entirely. Apollo thinks she's out of her mind with lack of sleep and overwhelming responsibility, but is she really? If so, who keeps sending her pictures of their baby on her cell phone? Then again, 4.5/5 stars! Apollo Kagwa grew up without a dad and now that he's a brand new father himself, he is determined to be there for every second of his son's life. Every second, that is, until his wife suddenly, crazily, gets it into her head that their baby is not their baby at all, but something else entirely. Apollo thinks she's out of her mind with lack of sleep and overwhelming responsibility, but is she really? If so, who keeps sending her pictures of their baby on her cell phone? Then again, the pictures keep "disappearing" from her phone after she sees them, so maybe she's out of her mind after all? You'll have to read The Changeling to find out! Victor LaValle is able to weave together myths and legends, make them believable, (for the most part), and then sets them down in the middle of New York City. It turns out the Big Apple does have some mystery and wilderness left in it, and Victor treats it all like his own personal playground. I felt like the city was a character in this story-with all of its history, hopes, dreams and death-the layers are all there. By the time the end of the story came around, I wished I could reach out and hug it-it had seen so much. One other thing about the writing that I wanted to mention was the author's ability to reach over and squeeze the life out of the reader's heart. Apollo's grief was so palpable at times, that I had to set aside the book because my chest hurt-my heart hurt. I generally consider my horror loving heart to be quite cold, but The Changeling proved me wrong. I'm sure at this point, just over halfway through 2017 that this book will be on my "BEST OF" list at the end of the year. If you find yourself looking for a satisfying story that combines myth and legend with the grit of real life in the modern world, I say pick up this book and let yourself fall under Victor LaValle's spell. You won't regret it! This review has been hidden because it contains spoilers. To view it, click here. Spectacular! A modern fairy tale, but not the sweet kind, more of the sort the Brothers Grimm told, a fairy tale with all the gruesome bits left in. Apollo Kagwa is not your typical New Yorker; he's a self-made bookseller, with a love for and and a good nose for sniffing out rare books. His father abandoning him as a baby has made him determined to be a good father, so when he meets a wonderful, strong woman, Emma, an adventurous, strong-willed librarian and falls in love and they have a baby, h Spectacular! A modern fairy tale, but not the sweet kind, more of the sort the Brothers Grimm told, a fairy tale with all the gruesome bits left in. Apollo Kagwa is not your typical New Yorker; he's a self-made bookseller, with a love for and and a good nose for sniffing out rare books. His father abandoning him as a baby has made him determined to be a good father, so when he meets a wonderful, strong woman, Emma, an adventurous, strong-willed librarian and falls in love and they have a baby, he believes all his fantasies have come true. His nightmare is only beginning. Apollo Kagwa has abandonment issues. His mother Lillian, Ugandan by birth, has raised him alone since age four, when father Brian West vanished. For years, Apollo has had recurring dreams of a man knocking on the door and pushing his way into the apartment. He envisions being carried through a fog and wakes up screaming. Lillian is forced to leave Apollo alone for hours in order to keep the family afloat. Apollo, a self contained, bookish child is a voracious reader. Childhood entrepreneurial exp Apollo Kagwa has abandonment issues. His mother Lillian, Ugandan by birth, has raised him alone since age four, when father Brian West vanished. For years, Apollo has had recurring dreams of a man knocking on the door and pushing his way into the apartment. He envisions being carried through a fog and wakes up screaming. Lillian is forced to leave Apollo alone for hours in order to keep the family afloat. Apollo, a self contained, bookish child is a voracious reader. Childhood entrepreneurial experiences selling magazines has led Apollo to a career as a book man. He learns to value books, attending estate sales in search of rare and valuable books. Along with friend Army vet, Patrice Green, they search for preserved First Editions. The importance of turning a profit cannot be understated since Apollo's wife, librarian Emma, is due to give birth to their first child. After son Brian's birth, the family's financial and emotional health changes. Emma experiences severe postpartum depression. But wait...Apollo uncovers a First Edition of "To Kill A Mockingbird" that he has appraised and authenticated. A buyer, William Wheeler, agrees to pay $70,000 for the tome. Apollo and Patrice are asked to bring the book to a location of William's choosing. This is when Scottish glamour, an old kind of magic, weaves its way into the midst. Illusions and altered reality make a baby no longer a baby. This clouded reality comes replete with internet predators watching the principals every move and documenting these moves for nefarious purposes. 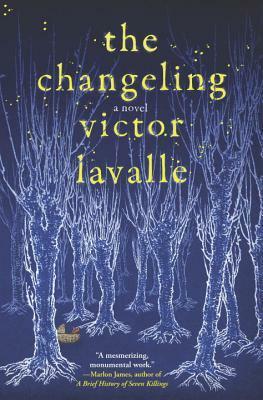 "The Changeling" by Victor LaValle is a many layered novel. It is additionally a cautionary tale about the dangers of posting family photos and personal information technologically. Thank you Mr. LaValle for the suggestion of vigilance as a safeguard. This is my second Victor LaValle and after the Ballad of Black Tom having washed through me and left me wanting so much more, I was very, very happy to be reading this. It has a very different feel in one way, but in another, it's exactly like coming home. Being in the story you always want to be in. What do I mean? The devil is in the details. It's very homey, feeling like delightful snapshots of family and home, full of the sweet and the bitter and the genuinely odd stuff that always comes alon This is my second Victor LaValle and after the Ballad of Black Tom having washed through me and left me wanting so much more, I was very, very happy to be reading this. The devil is in the details. It's very homey, feeling like delightful snapshots of family and home, full of the sweet and the bitter and the genuinely odd stuff that always comes along with life, and this feeling never lets up even after the really funky stuff starts messing with the MC. I felt warm and wrapped snugly in the story in a way that I rarely do, or at least, not this deeply. Maybe it's because of the new parenthood threads or maybe it's because of the geeky book-nerd outlook or maybe it's because the deepest thread in the novel happens to be one of the darkest myths handed down through the ages, but anyway that I looked at it, I was invested. From high hopes to deep stress to tragedy, horror, and a long, wrought quest full of very emotional reveals, this novel manages to put us through the ringer. I loved all of these characters. And I mean love, love. I'm still thinking of them in the same way that I keep thinking of Black Tom. It's the realization, amazing ability that all these characters come right to life and stay with us. The difference between understanding what one sees and seeing what one’s understanding permits is central to psychological realism in fiction. For Victor LaValle, this difference can also be explained when our understanding is asked to cross the boundary between the real and the uncanny. His dark fable, The Changeling, is the story of Apollo Kagwa, a book dealer whose storybook romance with librarian Emma Valentine is devastated when Emma disappears after committing an unimaginable crime. His jo The difference between understanding what one sees and seeing what one’s understanding permits is central to psychological realism in fiction. For Victor LaValle, this difference can also be explained when our understanding is asked to cross the boundary between the real and the uncanny. His dark fable, The Changeling, is the story of Apollo Kagwa, a book dealer whose storybook romance with librarian Emma Valentine is devastated when Emma disappears after committing an unimaginable crime. His journey to find his wife, and to discover the truth about her actions, leads him to an extraordinary turn of events that alters his understanding of the world he lives in. I think this book went over my head. I cannot be quite sure but I do think so. I had the overwhelming feeling of just missing something here – and I cannot quite put my finger on what that was. Bear that in mind while I try to figure out my thoughts while writing. In this book we follow Apollo and his wife both before they meet and after they have had their son. For about a third of the book, there is some menace lurking but mostly the story is whimsical and quite lovely, until suddenly it shifts I think this book went over my head. I cannot be quite sure but I do think so. I had the overwhelming feeling of just missing something here – and I cannot quite put my finger on what that was. Bear that in mind while I try to figure out my thoughts while writing. In this book we follow Apollo and his wife both before they meet and after they have had their son. For about a third of the book, there is some menace lurking but mostly the story is whimsical and quite lovely, until suddenly it shifts gears in the most traumatic way possible and Apollo’s life spin out of control. This book is genre defying in a way I usually absolutely adore – it is fairy-talesque in its whimsy and its frequent re-telling of familiar stories, it is horrifying beyond measure in a way that makes It seem quaint, it is a social commentary cleverly disguised as a page turner, it is a book about family and love and trust and the lengths we can go. And writing this down makes me want to change my rating but ultimately there were long stretches here where the book lost me. I found Apollo a difficult character to root for in the single-mindedness of his approach. He reacts more than he acts (and I like how this mirrors the way Germanic fairy-tales are structured) and flip-flops in his understanding of what is going on in a way that made being so close to him frustrating. The tonal shift I spoke about earlier first works brilliantly – the silent horror of the earlier scenes are full of foreboding and impressively rendered (I shudder to think of the first scene of Emma receiving a message that then disappears – so simple and so effective) and build the perfect crescendo to that scene (if you read the book you know which one I mean). After that the book seems to lose a bit of steam, important scenes are told in flashbacks, some strands of the story never go anywhere, and the reader is expected to go along for the ride – which sometimes worked better than other times. I think ultimately my enjoyment or maybe sometimes lack thereof comes down to genre preference. The whole book felt so unfair. And I do not deal well with unfair. It makes me feel anxious and stressed and doesn’t compel me to pick a book up. But nevertheless, this is in parts a brilliant book, with many many clever things I will be mulling over for some time to come. I received an ARC of this book courtesy of NetGalley and Canongate in exchange for an honest review. THE CHANGELING by Victor LaValle is so damn brilliant. Mash up of complex parental anxieties, life in Trumplandia, and dark fairy tales. starts like love actually, then becomes rosemary's baby, then becomes jurassic park. Reading this book felt exactly like turning the crank on one of those souvenir flatten-your-penny machines--you turn it over and over and over and over, with very little resistance, imagining all the time that it's what you wanted to be doing, and it feels like you're making no progress whatsoever, but you keep doing it anyway for what seems like forever and then, clunk, you're done--you just paid 26c and got back a penny that is no longer worth anything at all. Okay. Wow. So. This was my first Victor LaValle book, and I feel like he's going to be on the same level as Neil Gaiman for me. I loved his writing style--DAMN LaValle knows his way around a sentence... Seriously. I think sometimes people conflate great prose with flowery prose, but that's not really the case. LaValle knows when to be flowery, when to be curt, when to be formal, when to throw in a curse word. He's a master, and a delight to read. As for this boo Check out my video review! As for this book, specifically, it's one that I'm going to think about for a long time. It's an exploration of parenthood--in particular, black fatherhood--and it's absolutely phenomenal. Don't let the docked half-star fool you. I tend to hold literary fiction to a much higher standard than the genre fiction that I read, so 4.5 stars is an incredibly strong rating for me. A few reasons that half star was docked: I think the first two thirds had some TEENSY pacing problems. The final third, however, is a serious page turner. I also wanted more from Emma's character. In mythologizing her, LaValle also distances her, and I think he could have done some interesting things if he'd limited that distance a bit. At times LaValle is a bit too heavy handed with his metaphors, but this was a minor issue for me. One aspect I loved, in particular, was the way LaValle builds the fantastical elements. This starts out a story very rooted in reality, and slowly but surely LaValle introduces bits and pieces of fantasy, until the book turns into a full-blown fairy tale. That build up serves as a great device to build tension throughout the story. I also love just how much LaValle embraced the fact that this is a modern fairy tale. Technology plays a huge aspect in his story, and I really appreciated that. I can't wait to read more LaValle (The Ballad of Black Tom is on its way in the mail!). This intelligent, intriguing modern day fairy tale starts out in what seems to be a normal world. It begins with the birth of the protagonist, Apollo, a child of mixed race to Lillian Kagwa (a Ugandan immigrant) and Brian West (a white parole officer.) His father had held him as a baby telling him he was Apollo, the God. This becomes a mantra for Apollo later in life. Brian West disappears by the time Apollo is four years old, but Apollo continues to have dreams, or maybe nightmares, about his f This intelligent, intriguing modern day fairy tale starts out in what seems to be a normal world. It begins with the birth of the protagonist, Apollo, a child of mixed race to Lillian Kagwa (a Ugandan immigrant) and Brian West (a white parole officer.) His father had held him as a baby telling him he was Apollo, the God. This becomes a mantra for Apollo later in life. Brian West disappears by the time Apollo is four years old, but Apollo continues to have dreams, or maybe nightmares, about his father returning. In a box of items left behind by Brian is a well-read copy of Maurice Sendak’s Outside Over There. The Changeling becomes a retelling of this award winning children’s book. Apollo is an avid reader and at a young age becomes a buyer and seller of used books. This book also speaks to the new age of parenthood, of more involved dads, and of social media. Apollo Kagwa is one of these new age dads who is very much involved in the parenting of his child. He enjoys taking him to the playground and bragging with the other dads about new milestones. He posts countless photographs of his son, Brian, on Facebook. Apollo’s wife, Emma, meanwhile, begins showing signs of postpartum depression. She tells Apollo that she has received strange texts of pictures of the baby that have disappeared shortly after receiving them, which Apollo dismisses. “You’re what’s wrong with our family, Emma. You. Are. The. Problem. Go take another pill.” The horror in this novel is the experience of parenthood itself, the no-win situation regarding the expectations facing parents, the feeling of needing to protect your child, and ultimately the loss of a child. Apollo finds a signed first edition of Harper Lee’s To Kill a Mockingbird with the inscription to Truman Capote, “Here’s to the Daddy of our dreams.” He knows that this book could have a great payday, however, it does not pay in the way he expects. After barely surviving the wrath and rage of his wife, he realizes that perhaps his wife was right. He ends up on a journey with many twists and turns through mystical realms of witches, trolls and even some human monsters. This novel warns of the dangers of social media and putting your life out there for all to see, judge, and possibly take advantage of. William tells Apollo, “Vampires can’t come into your house unless you invite them. Posting online is like leaving your front door open and telling any creature of the night it can come right in.” It seems that Emma Valentine and Brian Kagwa were the perfect target for trolls with the publicized birth of their son, followed by continuous Facebook posts by Brian. This book speaks to deeper truths about the monsters within each of us. The glamer we are able to superimpose over our own misbehaviors to make us feel better about ourselves. It warns of trolls lurking in everyday places and people. This book is not simply a retelling or a fairy tale, there are many layers and depths to it. The social commentary is sharp, but easily consumed within the context of this fantastical setting. It is about the stories we tell ourselves as well as our children and the effect these stories have on us. There is some pretty graphic violence though, so consider yourself forewarned. Thank you to the publisher and netgalley for an ARC of this book in exchange for an honest review. An excellent book that deftly melds the monsters of the old world with those of the new. LaValle's voice feels firmly a product of his time and place and it provides a rich multi-dimensional aspect to the characters and their story. The story itself is contemporary realism that slides into fantasy that slides into horror and circles back again. Real and fantasy horror combine in both subtle and sharp ways to create a violent and at times gory tale. Running throughout is an unavoidable social commentary on race and society, social media, family and parenting, and the tangled mess all of these make when combined. With THE CHANGELING, Victor Lavalle has given us a modern day urban fairy tale, complete with witches, Norse legends, and mayhem. But really at its heart, this novel is about families, and how our children are nurtured or neglected. It's about our memories of childhood, and what we believe or choose to believe is real. Sometimes the veil is very thin between the worlds of truth and illusion. There is also a strong current in this story of violation, which manifests itself in the potential loss o With THE CHANGELING, Victor Lavalle has given us a modern day urban fairy tale, complete with witches, Norse legends, and mayhem. But really at its heart, this novel is about families, and how our children are nurtured or neglected. It's about our memories of childhood, and what we believe or choose to believe is real. Sometimes the veil is very thin between the worlds of truth and illusion. There is also a strong current in this story of violation, which manifests itself in the potential loss of our personal privacy as individuals. Part of the conflict arises in this book when a few characters are subjected to an invasion of their personal lives through their cell phones and computers. They are spied upon, deceived, and manipulated all because of the whims and twisted motives of a deranged perpetrator. Victor LaValle is one of my new favorite authors. THE DEVIL IN SILVER is my favorite of his books, but this is a close second. I enjoyed reading about a father who'd do anything to save his kid. All too often these stories make the mother the savior while the father is left as the bumbling sidekick, or as is the case a lot of the time, the father is the villain. It was awesome to finally read a story where the dad wasn't worthless. 3.5 stars. I'm not a fan of fantasy or magical realism books, but LaValle's modern urban fantasy was very well-written and certainly kept me reading until the end. The first half of the book, which was well-grounded in realism, was the most interesting and exciting portion for me, as LaValle truly provided an insightful look into the mind of a modern new parent and the struggles of raising an infant in the social media age. As the story progressed, and the elements of magical realism slipped in, 3.5 stars. I'm not a fan of fantasy or magical realism books, but LaValle's modern urban fantasy was very well-written and certainly kept me reading until the end. The first half of the book, which was well-grounded in realism, was the most interesting and exciting portion for me, as LaValle truly provided an insightful look into the mind of a modern new parent and the struggles of raising an infant in the social media age. As the story progressed, and the elements of magical realism slipped in, I found my interest waning, but only because of my own tastes. The fantasy elements were melded into the realistic world quite well, though. I’m compelled to compare LaValle to Stephen King, especially the domestic novels. Like King, Victor LaValle ably mines the struggles of ordinary families, and intertwines extraordinary circumstances, via supernatural horror and gristle. He does this to emphasize bitter realities—a palimpsest of fractured Maurice Sendak fables, with strained domestic life that ironically underscores rather than distracts from everyday family problems. What I like better about LaValle is that he does it without pl I’m compelled to compare LaValle to Stephen King, especially the domestic novels. Like King, Victor LaValle ably mines the struggles of ordinary families, and intertwines extraordinary circumstances, via supernatural horror and gristle. He does this to emphasize bitter realities—a palimpsest of fractured Maurice Sendak fables, with strained domestic life that ironically underscores rather than distracts from everyday family problems. What I like better about LaValle is that he does it without platitudes, but still executes a fantastical morality tale. Or is it a cautionary tale? I don’t want to reveal what the reader will discover inside these pages. It starts with the love of a Ugandan immigrant, Lillian Kagwa, a statuesque beauty, and a white parole officer, Brian West. They meet in NYC, marry, and have a son, Apollo. But, unfortunately, Brian leaves—vanishes—when Apollo is just a child. Lillian’s love and formidable endurance carry on, raising Apollo with commitment and strength, albeit with a few mistakes. But it was difficult being a single mother in New York in the 70s and 80s. After Brian vanishes, Apollo has a specific and recurring nightmare about his father, which introduces the dreamlike, supernatural elements of the book. Complete with steamy clouds and vapor, his father both frightens and promises him with his presence and absence. There was also the day that Brian leaves a gift—a box of memories—at the door, which just ratchets up the immediacy of the subsequent dreams. Tucked in the box among the various memorabilia is a children’s book by Maurice Sendak. Outside Over There, which Brian nightly read to Apollo when Apollo was a wee child. If you are familiar with this tale (not as well known as Where the Wild Things Are), then you have a jump start on the narrative’s parable—or a parable of a parable. I was not familiar with it, so the gradual reveal was another nugget of surprise for me. Apollo becomes the main protagonist of the story. He become an antiquarian book dealer, naming his business Improbabilia, and traverses all the NYC boroughs and sometimes beyond in order to seek out great finds. He meets, falls in love, and marries the lovely Emma Valentine, and they have a son. The birth scene alone has cinematic optics. As the tale settles on Apollo and Emma’s life with baby Brian, the suspense escalates with the creepy chill of things that go bump in the night—or broad daylight. LaValle keeps the narrative propulsive with a superb plot and rich characterizations. The 400+ jumbo-sized pages never feel cumbersome, because you’ll be too busy turning them with relish. The climax is both classic and contemporary, with ancient myths and modern technology fused together. But LaValle has utter control of his themes—of courage in devotion to family, and the lengths we will take to protect the people we love. I felt fatly satisfied when I finished this extravagant tale. A very strange, very adult fantasy intermixing current social media and technology with ancient Norwegian folklore. A sort of hip hop horror meets Grimm Fairytales. Ostensibly a very twisted tale of fatherhood, marriage and parenting. This was a novel geared towards a younger generation but was distinctively not YA. I think this was very clever writing and it was also suitably creepy. Not my favorite read of the year but to LaValle's credit, I think that has more to do with my generation and lit A very strange, very adult fantasy intermixing current social media and technology with ancient Norwegian folklore. A sort of hip hop horror meets Grimm Fairytales. Ostensibly a very twisted tale of fatherhood, marriage and parenting. This was a novel geared towards a younger generation but was distinctively not YA. I think this was very clever writing and it was also suitably creepy. Not my favorite read of the year but to LaValle's credit, I think that has more to do with my generation and literary tastes than his writing. Norwegian fairytales are not my thing. Though the book did drag in parts and felt overly long; I think LaValle is a talented author and I will be reading more by him. 3.5 Stars rounding up for unintelligible reasons…mostly because I want to. THE CHANGELING is a fairy tale for the modern day. A real fairy tale, the kind where people die and the words 'happily ever aftet' are never uttered. It’s horror, urban fantasy, and ‘regular’ fantasy all put together. It portrays the dangers of internet oversharing, trolls, and being a person of color on the streets at night. But the heart of the story is how love will make a parent go to any lengths to save their child. This is a story about the bad things that happen to parents who spam too much of their kids' lives on Facebook. I first discovered The Changeling on a list of "Dark fairytale books", a list which included several books I had already read and loved - but unfortunately this one just wasn't my cup of tea. Started out slowly introducing the characters and their backgrounds and relationships and I should be caring about them, shouldn't I? Yet they felt somehow dispassionate, hollow. I couldn't seem to This is a story about the bad things that happen to parents who spam too much of their kids' lives on Facebook. Started out slowly introducing the characters and their backgrounds and relationships and I should be caring about them, shouldn't I? Yet they felt somehow dispassionate, hollow. I couldn't seem to connect with them and at this point I was considering DNFing the book. However, things got a little more interesting after Brian was born. They need the money, so Emma is forced to go back to work soon after, and baby Brian spends the days with his dad. Mum is sent photos of the two of them out together - but who is taking the photos and why are they always gone when she tries to show the photos to Apollo later? Is something mystical going on? Is Emma just going crazy? Apollo seems to think so as Emma becomes convinced that Brian is not their son - that it's not a baby. But no sooner has my interest been piqued than it loses me again. There are a lot of things going on, but I'm still distant from them because of my disconnect from the characters. Is Patrice still a friend? Why is the book buyer so eager to help? Why did the woman at support group share Emma's worrying sentiment that her baby is not a baby? There is an island community of lost women in the middle of nowhere that didn't really seem to have any relevance to the plot. This book was a surprise and delight for me. I normal do not care to read Sci-Fi, but this was different it was a good read. It begins with a black hippie couple having a baby the natural way at home with a mid-wife. Apollo and Emma Kagwa has baby Brian on the subway in New York because he comes early. All the preparation for the birth actually comes to realization in front of strangers. It was the highlight of their marriage and the beginning of their family. What happens next is unforgettable, This book was a surprise and delight for me. I normal do not care to read Sci-Fi, but this was different it was a good read. It begins with a black hippie couple having a baby the natural way at home with a mid-wife. Apollo and Emma Kagwa has baby Brian on the subway in New York because he comes early. All the preparation for the birth actually comes to realization in front of strangers. It was the highlight of their marriage and the beginning of their family. What happens next is unforgettable, Emma starts to see Brian as something other than a baby. She sees him as a demon. This image takes Apollo and Emma into the history of the Norwegian pepole who settled in Queens, NY and the monster referred to as the troll. The descriptions are vivid and you the reader can see them in your minds eye as you read. How far will they go to save baby Brian? You must read to find out. Apollo nearly sank at the words. The single concrete road that wormed through the middle of Forest Park had been soaked so dark, it looked freshly laid. This book is the equivalent of going to an amusement park and getting on a carousel, then realizing it's actually bumper cars, but somehow ending up in Haunted Mansion. Some people will see this as a good thing, others will be frustrated by it. Personally, I ended up really enjoying the novel, especially since it did bring most of the elements together towards the end. Victor LaValle certainly has a lot to say about parenting, the dangers of oversharing online, the stories we repeatedly tell to This book is the equivalent of going to an amusement park and getting on a carousel, then realizing it's actually bumper cars, but somehow ending up in Haunted Mansion. This received a Kirkus star and many good reviews, but for me the attempt at merging the magical realism/fairy-tale atmosphere with modern day technologies and parental anxieties missed the mark. I felt like there were many good ideas here, but possibly too many all thrown in together. Right from the very first sentence—“This fairy tale begins in 1968 during a garbage strike”—Victor LaSalle signals what he intends to do: weave the magical spell of fairy tales with the gritty reality of present day New York. Indeed, the opening is grounded in that reality with memorable images: the birth of our protagonist Apollo Kagwa’s child on a stalled A train with no midwives in sight, and a particularly horrific scene later on where Apollo is tethered by a bike lock to a hot water pipe. Wh Right from the very first sentence—“This fairy tale begins in 1968 during a garbage strike”—Victor LaSalle signals what he intends to do: weave the magical spell of fairy tales with the gritty reality of present day New York. Indeed, the opening is grounded in that reality with memorable images: the birth of our protagonist Apollo Kagwa’s child on a stalled A train with no midwives in sight, and a particularly horrific scene later on where Apollo is tethered by a bike lock to a hot water pipe. What has become of his son? The theme of the book comes down to this: How do we protect our children, when no matter what we do, the world finds its way in. It is about the fears that have been with us since ancient times when we fall short of being the strong protective parent—the father of light and truth. Archetypal stories are integrated with the one that Mr. LaValle is crafting here. As an antiquarian book dealer, he happens across a first edition of To Kill A Mockingbird (“It’s just a tory about a good father, right? Nobody could live up to it, not in real life…”), and later re-hears the story of Rapunzel (“The old man and woman have a child. 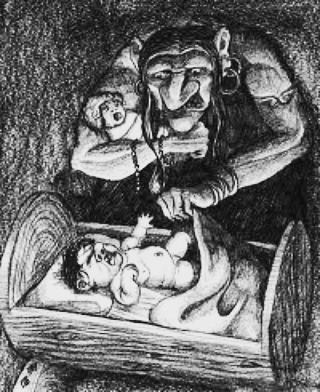 But they do nothing to protect it.”) There are also nods to Maurice Sendak’s picture book, Outisde Over There, a story of a baby stolen by goblins. The monsters today might not be fire-breathing dragons; instead, they can be the fervent need to document every minute on social media, that causes you to leave “a trail of breadcrumbs any wolf would follow; then act shocked when the wolf is outside your door”. As the story develops, allegory blends with the true evils of the modern world, and the book can be read on two levels. The novel’s one fault is that it veers into cinematic unreality, striving a little too hard to untether the reader from her comfort zone. Still, there is real humanity in these pages. As LaValle writes, “A great fairy tale tells the truth.” And the truth, in the end, will out. Don't even know what to say about this book. It took my breath away and the ending was just fantastic. I saw that some of my friends on Goodreads were reading this and I already had plans to read this because I loved LaValle's last book "The Ballad of Black Tom". I didn't think that this book would even hit what I loved from the previous book but it did. This book was just the best of the horror genre. I think I heard someone once say the way to best judge a story is if it sounds true. And this b Don't even know what to say about this book. I saw that some of my friends on Goodreads were reading this and I already had plans to read this because I loved LaValle's last book "The Ballad of Black Tom". I didn't think that this book would even hit what I loved from the previous book but it did. This book was just the best of the horror genre. I think I heard someone once say the way to best judge a story is if it sounds true. And this book felt true to me to the point I maybe turned some lights on cause I started getting a creepy feeling someone was watching me. I also really loved that Lavelle takes his own observations about African Americans, about America, about where we are in the state of the world, about the internet, about mythology and just turns it into this book. I delayed reading this for a couple of days just because I wanted to savor it and of course I just rushed right through this whole thing so that's just my initial thoughts on this book. "The Changeling" follows Apollo Kagwa who is given the name of the good of the sun, but feels often out of step with the world around him. Raised by his mother after his father left them, he still feels the mark the absence of his father had on him as he grows up. Turning to books, because at least he can understand the worlds they open to him, he eventually becomes invested in the world of being a book dealer. When he comes across Emma Valentine, he thinks that his life has changed. And when they marry and have a son, he finally thinks that he has reached what has eluded him his whole life, a happy family. I don't want to spoil, but I have to say this book has so many twists and turns, that I had no idea where the book would go next. Which is a great feeling. Sometimes while reading a book, I often feel like I can tell where the authors going because they use so much foreshadowing or just cliches in the writing that nothing's a surprise. So it's a wonderful feeling again to read a book like this and be surprised. I thought that all of the characters in this book were so well-rounded and I really did think that Apollo, Emma, Emma sister, Apollo's best friend Patrice, I could feel like I was in the room with them when certain scenes were happening. I definitely have a lot of questions about Apollo's mother and to thought that LaValle left a hanging thread. Or maybe I just didn't read closely enough. I thought the writing was very good and I just love the initial setup. I mean I definitely think a word for the wise is that when you start to read this book it might read as a typical fairy tale with a bit of horror, but everything just worked. The flow was great too. The setting was New York, but a New York I haven't read about in years. Most days if New York is the setting, the main character is either living in a great place with a roommate and a lot of room, and or someone working at a job that makes six figures, so New York is super exciting. Heck, even when the plot is contemporary it seems like authors are reluctant to say hey, if you like bed bugs, come to New York. The ending was a surprise. After reading "The Ballad of Black Tom" I know LaValle can go dark. Very good!